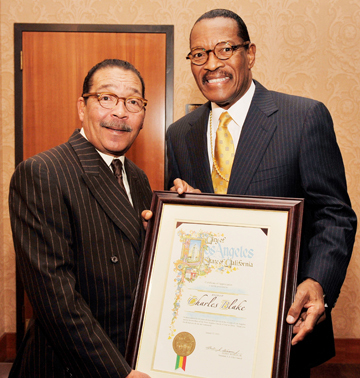 Bishop Charles E. Blake, Founder and Chairman Emeritus of West Angeles Community Development Corporation (CDC), will bestow the Unity Award for Man of the Year to Los Angeles City Council President Herb Wesson on Thursday even­ing, February 7, 2013 at the Regent Beverly Wilshire Hotel in Beverly Hills. “Council President Herb Wesson has been a big proponent of our efforts to reduce blight, preserve homeownership and infuse economic vitality in the neighborhoods of South Los Angeles,” says Bishop Blake. “It’s a special honor for me to be recognized by Bishop Blake and the West Angeles family,” said Wesson. “Bishop Blake has been an inspiration to me and our community for many years. Through his dedication and service, he has set an example and blazed a trail that more of us should follow. This special honor inspires me to work harder, reach higher and continue to deliver for God and our community." Past honorees include Senator Dianne Feinstein, Mayor Antonio Villaraigosa and County Supervisor Mark Ridley-Thomas. More than 500 community, corporate and political leaders, along with mayoral and city council candidates, are expected to attend. The event begins at 6pm for the reception, dinner follows at 7:30pm. The West Angeles CDC Annual Unity Awards is the first major event celebrating African American History Month in Southern Cali­fornia. This year, the Unity Awards will commemorate 150 years since the end of slavery in America. Established in 1995, The Unity Awards recognizes the achievements and examples of leaders from politics, entertainment and business that support faith-based community development. West Angeles CDC will also honor Freddie Mac with the Unity Award for Outstanding Corporate Citizen. “We have been impressed with the efforts of Freddie Mac to bring about recovery of the housing market across the nation and in our community with a spirit of partnership,” says Tunua Thrash, Executive Director of West Angeles CDC. The mission of West Angeles CDC is to alleviate poverty, increase social and economic justice and demonstrate compassion through the vehicle of community development. For nearly twenty years, West Angeles CDC has been at the forefront of promoting, facilitating and saving homeownership; developing blighted properties; conducting financial education and assisting families in emergency crises.